Here are some good tips for your eyes this fall. For me I like the smoky look on girls. Autumn is a renaissance season for the eyes. It's a vibrant time for earthy color as we return from the lighter, subtle shades of spring and summer. In autumn, we are still living off a healthy glow - and with this sudden revived pace of life, our eyes are allowed a lot more drama. What are colors are we eyeing for this fall? "The jewel-box inspired palettes of ColorStay 12-Hour Eyeshadow Quad, by Revlon, are simply exquisite," says Lucy Frechette, company PR associate. "There is something for every personality because the shade range is so versatile. You can go light and sheer or build color by mixing shades or layering for a more dramatic look. The smoldering shades are illuminated with bronze and pewter highlights to give eyes an alluring look." Application Tip: Sweep a matte shadow in a neutral shade from lid up to the crease, no higher. Deep gold or terra cotta is sensational this fall. Apply a chocolate brown pencil liner on both the upper and lower lids. Easy to achieve with: the ColorStay 12-hour Eye Shadow in Copper Spice with advanced "color-lock" patented technology and specially treated micro-pigments. Application Tip: Line upper lashes from inner corner to outer corner with a black or brown eyeliner. Use the same pencil to dot between lower lashes. 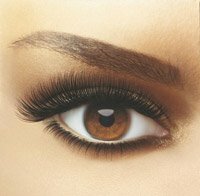 Smudge both top and bottom lash lines and sweep a dark espresso powder eye shadow all over your lids, into the crease and blend it up and outward from lash line. To create a contrast, sweep a light, neutral shadow over your browbone. Don't blend it down into the crease. Finish with two coats of volumizing mascara for extra drama. Easy to achieve with: the ColorStay 12-hour Eye Shadow in Coffee Bean, ColorStay Eyeliner in Black/Brown and Fabulash Mascara in Blackest Black. Application Tip: For the most impact use a medium to dark green as a liner, by sweeping it all across the top lash line. Above it, sweep another autumn shade, like bronze or deep gold, across the lid beneath the crease. Easy to achieve with: ColorStay 12-hour Eye Shadow in Spring Moss, or, Neutral Khakis from the Eye Wonder collection. To complete these autumn eyes, Frechette reminds us to curl our lashes, tweeze our brows (with the slant tip tweezers) and achieve a perfect finish with the Beautiful Brow Styling Kit to help fill and set brows. October is Breast Cancer Awareness Month, a time when many corporate sponsors rise to he occasion with fund-raising plans. For example, if you are buying eye shadow, mascara, or eyeliner this month, it's worth noting that a portion of proceeds from the sales of items in the Eye Wonder collection (by Revlon) will go directly to the Canadian Breast Cancer Foundation. "Women have given us so much over the years," says company marketing director Garry Scott, "and we're proud to be able to give something back."